Feelif Draw is a special application for drawing, with the possibility of sensing and listening to what a user has drawn. Since it is so versatile, it is suitable for the blind and visually impaired and as well as parents and teachers of blind and visually impaired children. It will enrich and brighten their everyday! It gives blind and visually impaired people an opportunity to express their creativity over and over again in a digital world. The drawings can be saved and send via e-mail from Feelif devices. The art can be converted into a standard image and made easier for others who don't have Feelif to admire on their own smart device. The application uses various combinations of vibration, sound and color. For each color we set its vibration and distinct sound of a musical instrument, to make it easier to distinguish between the lines that are drawn. This way you will not only feel your pictures, but also hear them in the sounds of the piano, guitar or violin. By moving your finger along drawing, you will be able to elicit variety of tones repeatedly, as the sound harmonically changes according to the direction of the touch. 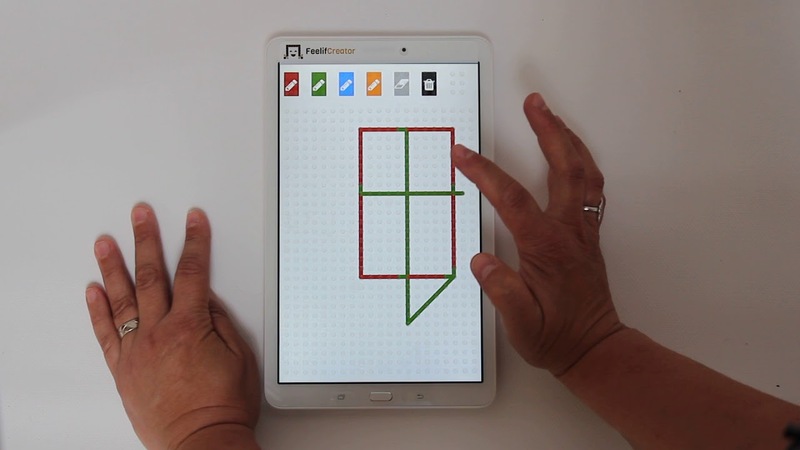 Feelif Draw is also a superior tool for parents and teachers of blind children through which they can explain their illustrative content to their children easier and faster. Feelif Draw application will give to the blind and visually impaired privilege to express their creativity over and over again, with neither costs for expensive materials nor concern where to stash all those cherished products, for the final product is digital content. As such, it is easy to archive and always available for re-viewing. Our Feelif Draw application in fact allows you to save the drawn contents as well as to send it via e-mail. Feelif Draw application is also capable to convert drawn content into a standard image, which makes it available to admire by those who do not have the Feelif Creator. For those who do have it, your content will be received in original format with full multisensory perception options.